Young women are an integral part of the rising generation of Tunisian leaders and entrepreneurs. Through two programs, they are teaching STEM skills to American students while gaining valuable professional skills themselves. Nouha, Ons, Chaima, and Arij are four of the over 400 Tunisian youth who have visited the United States through the Thomas Jefferson Scholarship Program during the past 5 years. The program consists of the Tunisia Community College Scholarship Program (TCCSP) and the Tunisia Undergraduate Scholarship Program (Tunisia UGRAD), which are funded by the US Department of State and implemented by IREX. Nouha studied computer science as a Tunisia UGRAD scholar at SUNY-Plattsburgh in 2017-2018. While there, she served as a mentor for a weekly technology club run by the Plattsburgh Public Library in collaboration with Girls Who Code. Girls Who Code is a women’s technology community with over 40,000 members across the United States. 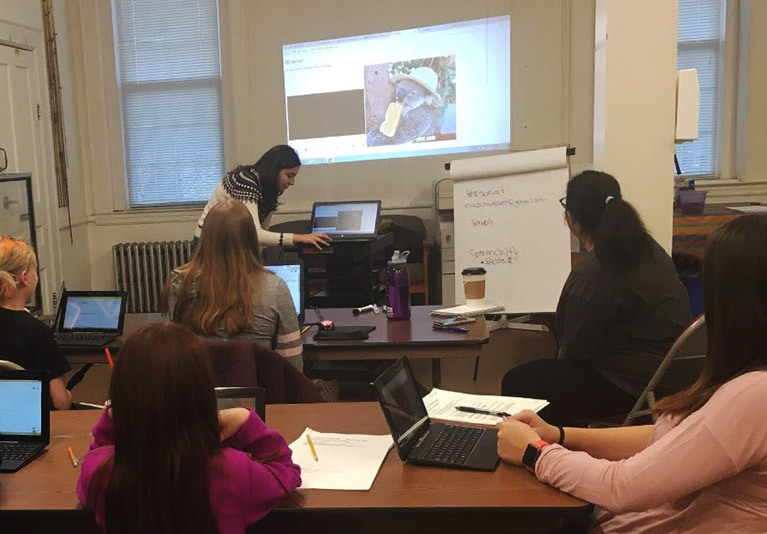 Through this community, Nouha taught computer programming skills to elementary and middle school girls from diverse socioeconomic backgrounds in Plattsburgh, New York. Noticing that she was one of only a handful of female computer science students on campus, Nouha decided to join an initiative that supports girls to pursue careers in computer science and technology. As part of this work, Nouha led a group of elementary and middle school girls to design and build a website for an animal shelter. Nouha further enhanced her technical skills by providing support for system administration, programming, and web development as an intern with the SUNY-Plattsburgh Library and Information Technology Services. 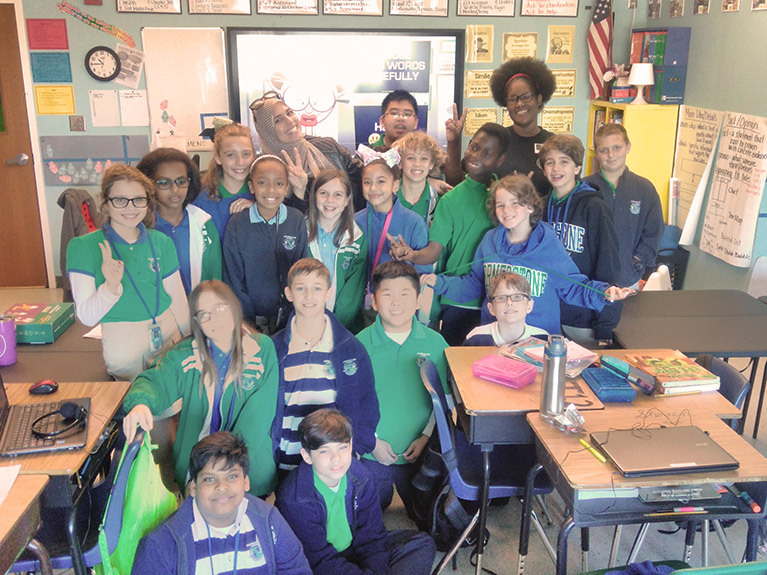 TCCSP scholars Ons and Chaima helped implement a cyber safety training program for students at Cornerstone Charter Academy High School in Belle Isle, Florida. They did this through the Cyber Security Club at Valencia College, where they were both studying information technology during the 2017-2018 academic year. Ons and Chaima trained third- and fourth-grade students on how to safely use the internet and how to best protect themselves from online scams, bullying, and other threats. The sessions included how to identify potential online risks, how to protect personal information, how to use security settings in social media and online gaming platforms, and how to talk to parents and teachers about online experiences. During the spring 2018 semester as a Tunisia UGRAD scholar, Arij, an environmental science exchange student studying at the University of Wisconsin in Green Bay, joined an initiative called DigiGirlz. DigiGirlz is a Microsoft YouthSpark program. It gives middle and high school girls opportunities to learn about careers in technology, connect with Microsoft employees, and participate in hands-on computer and technology workshops. Arij’s work involved leading a group of girls from Green Bay to build an app for an app development challenge. Arij used the program to enhance her skills in mobile development and app development. She also used online games and other technologies to teach local youth about important environmental issues like climate change. “Working with such a diverse group of local youth from around the Green Bay area on science and technology-related programs was one of my best experiences as a Thomas Jefferson Scholar,” she said. By promoting STEM knowledge among their American counterparts, these young Tunisian women further developed their technical skills in STEM-related disciplines, while simultaneously building strong personal and professional networks that they will bring to Tunisia to support their home communities. The Thomas Jefferson Scholarship Program consists of the Tunisia Community College Scholarship Program (TCCSP) and the Tunisia Undergraduate Scholarship Program (Tunisia UGRAD). The programs are funded by the US Department of State and implemented by IREX.